Pitch bending synths have become very popular in EDM. There are a few tricks to making the synth bend. In the process of making a bending synth you will learn how Viking’s modulation busses work. 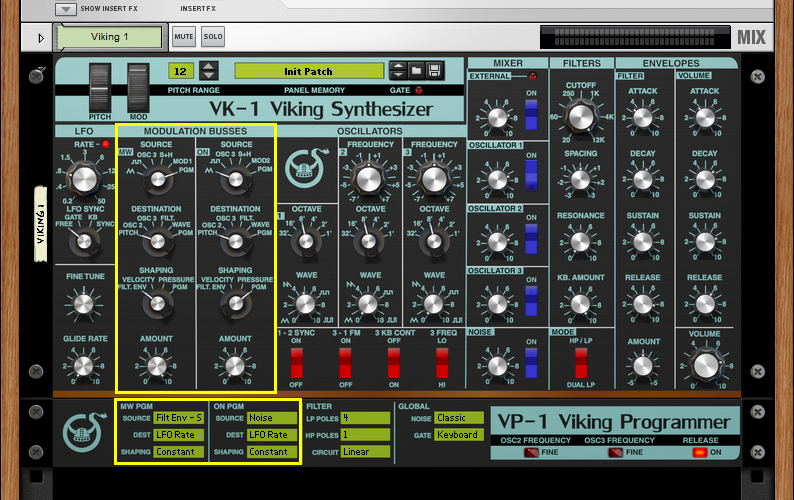 Start with a Viking that has a basic synth patch, or right click and select Reset Device. The most basic bending aspect is the Glide Rate. Glide Rate is the same as Portamento on other synths so it’s pretty straightforward. To get other pitch effects during a note we use one of the envelopes as a modulation source. So you’ll need to know a little about the modulation busses. There are two modulation busses, Mod Wheel and On. Each bus has a source, destination, shaping, and amount. If the common choices given on the selector switch aren’t what you need, then you can select Pgm and choose from a wider selection in the Programmer. We will use the Mod Wheel bus which has its final amount proportional to the Mod Wheel. This image shows the patch we will make with the modulation busses highlighted. We would like the source to be “Filt Env – S”. This means that the source will be the filter envelope minus the filter sustain amount. What it really means is that the pitch will be at the actual note during the sustain part of the envelope. To select this source, we set the the MW Source selector to Pgm. Then select “Filt Env – S” as the Source for MW Pgm in the Programmer. The destination should be pitch. This one is on the selector so just move the MW destination selector to Pitch. Shaping can increase the effect of the source but does not decrease it. We will increase the effect by using the filter envelope for Shaping, so move the selector to Filt Env. Turn the Amount knob all the way up, the Mod Wheel acts as another amount knob to control the amount of the effect. Now you can use the filter envelope to create pitch effects. You will probably want to set the volume release at or below the filter release for pitch drops. Reduce the sustain and adjust the attack and decay for effects at the beginning of the note. You can automate the Mod Wheel to control when the effect occurs. One other control that might come in handy is the Release toggle switch in the Programmer. It can be automated to turn on and off the release phase of the envelope. The patch can similarly be made with the On bus or the amp envelope. With these modulation concepts you should have the skills to create some fun pitch effects and start trying out other ways to use the modulation busses as well. As always, leave comments, questions, or suggestions below.